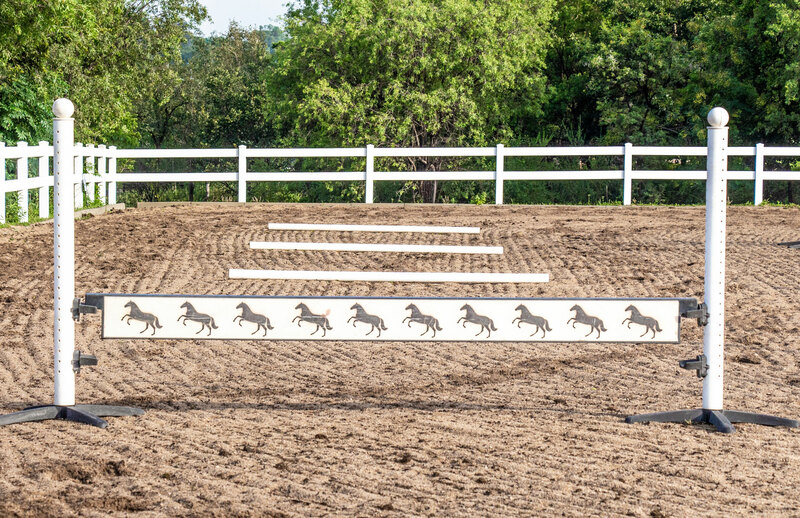 Rushing into jumps is a common problem and while lots of riders would rather have a horse that pulls you to the jumps than a horse who you have to push to the fence, rushing becomes a problem as courses get more complicated and jumps get higher. If you are constantly trying to slow your horse then it can be very difficult to get the correct amount of strides through a related distance. It can also make it harder to turn effectively during a jump off – and a horse who is rushing will often throw a flat shape over the jumps making them more likely to knock poles. Set up a placing pole, followed by a small cross pole approximately 2.5 metres (or three normal human steps) after the placing pole. You will then set up a short one-stride distance to a small upright – around 6.4 metres, or a 7 stride distance if you were walking a course. Put a placing pole in the middle between the cross pole and small vertical. Add one more placing pole after the vertical, again at around 2.5 metres away from the fence. Trot or canter in to the grid, allow the horse to canter over both jumps and the final pole, and then quietly transition to walk. Calmly walk around to the start of the grid and only trot a few strides before the pole. The canter pole at the end of the grid is designed to stop horses from shooting off after landing. To make this exercise more difficult, you can canter in rather than trot, and add in more jumps as you become competent. Placing poles between fences force the horse to wait for the jumps, and the shorter distances help to prevent rushing by placing the horse deep at the fence. Another good exercise to practice with horses who rush is to set up a line of canter poles; 4 to 5 is fine, but you can add more (or work with three) depending on how much space you have available. The last pole is followed by a small vertical. The spacing for canter poles will be around 6.4 metres, or 7 paces. If your horse is small or has a short stride, you can shorten it by one pace. The distance from the last canter pole to the jump should be an even one stride with 8 human paces or approximately 7.3 metres. Ride through the poles asking the horse to wait and stay rhythmical. You may have to do this a number of times but continue to ride straight through the poles focusing on a clear rhythm. 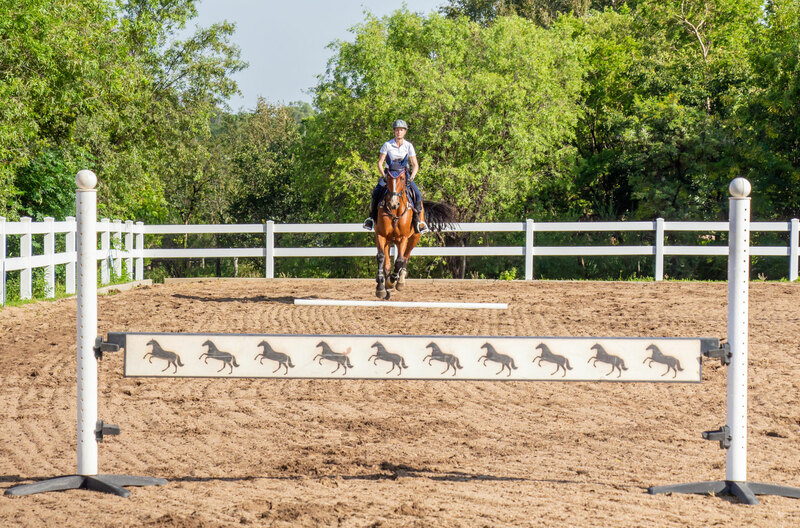 When your horse starts settling through the exercise, remove the pole nearest to the jump. The goal is to remove all of the poles except but one, and canter on a steady related distance (usually around 7 or 8 strides depending how many canter poles you had) from the pole to the jump. A very simple exercise which is often underrated, we’ve heard this be called everything from ‘the wheel of death’ to ‘just so boring!’. What it is good for, though, is establishing a good rhythm and good canter. 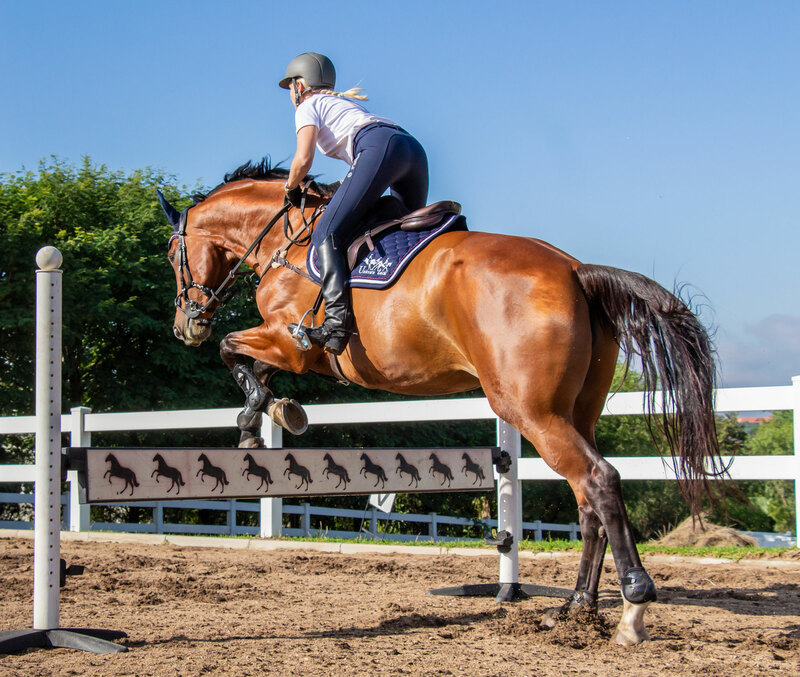 Because the jumps keep on coming, it’s also great to help the rider work on their eye – this in itself can be helpful in stopping rushing as continual inconsistent distances on the approach and take off can make a horse anxious and cause rushing. Set up two cross poles at 12 and 6 or 3 and 9 on a circle. You can, of course, build this up to four fences as your horse starts to sit back and listen to your aids. It takes a good amount of discipline to ride the fences accurately and consistently each time, from both you and the horse. Your job is to sit quietly, prepare the horse to land on the correct leg by looking where you’re going, and not let him change the rhythm in between the fences. Your aim is to get the horse deep into the fence and keep a short, bouncy canter the whole time. Focus on getting your horse bent around your inside leg and containing the canter. Because of the repetitive nature of the exercise, it can help to settle fizzy horses and relax them as they realise that nothing “exciting” is going to happen.